Question: Can a physical object induce emotion contagion? 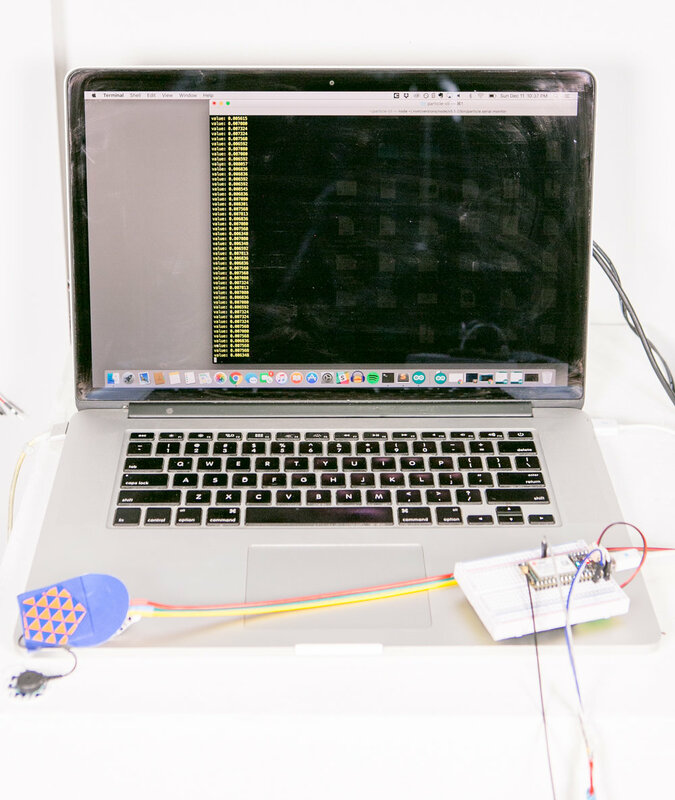 Outcome: Through the creation of the Smile Transducer, a wearable wireless device that tracks and transmits smiles, we were able to collect facial muscle movement data associated with smiling, and paired this device with a smile board. Due to the design of the smile board, we were unable to test whether emotion contagion had occurred. One goal of the Smile Transducer research was to explore this idea of emotion contagion in a digital space between familiar and non-familiar participants. This was achieved by sensing real vs. fake smiles, and by placing a smile board (pictured below) in a small public environment where participants could observe the smiles of their peers. This study was trying to measure if the participants were more likely to smile if they knew one of their friends was smiling vs. a stranger (familiar vs. non-familiar relationships). Participants were quite interested in using this smile data to suggest locations and experiences that would be likely to evoke more smiles. The smile data paired with smile reviews from similar participants could predict events that would be more likely to evoke a smile. Smile data from the Smile Transducer can assist with place based data experiences and planning. One of the challenges with this prototype, was that the smile board itself would make people smile. Participants reported responding to the friendly sound of the multiple servos and bright colors. Simply approaching the smile board would make them smile. Design Considerations: The form research went through several iterations, starting from a circular prototype, that went around the ear and came across over the cheek. There were two main challenges with this prototype: reported comfort and reports of feeling like a customer service agent, reminiscent of emotional labor. The focus of this project was to create a new form that speaks to smiling and non-smiling with different people, across different locations and situations. 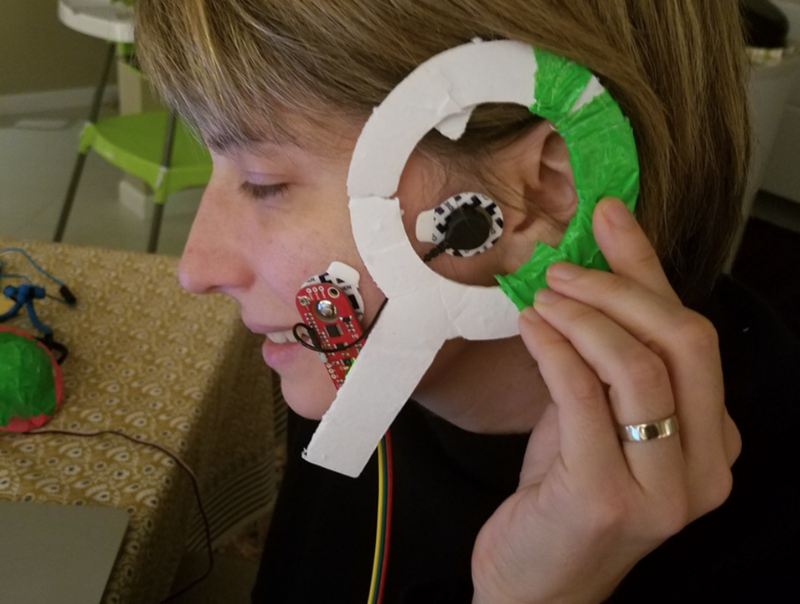 Further research informed the second prototype, which was a sticker based wearable, which could be easily removed and has two physical switches, one that can turn off or on the transmission of smile data and one that can turn off or on the haptic receipt of others smile data. 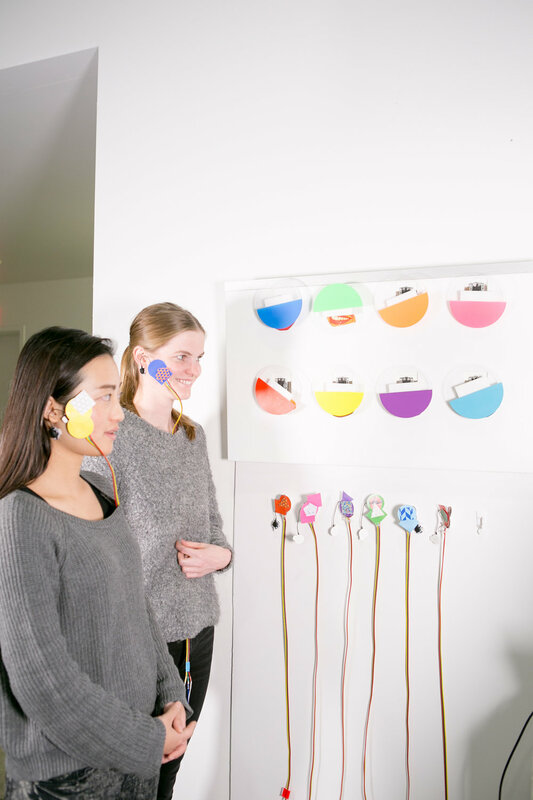 The third and final prototype was worn across the face and the sensors would not only measure smiles, but tear presence and other micro-expressions. Sociocultural Considerations: This project comes very western based perspective, where a genuine smile is associated with positive engagement and women report feeling the need to smile or report being told to smile. One of the interesting topics this project explores is genuine vs. fake smiles. Much of our user research focused on how to send and receive smiles, but many of the women identified humans in the study reported wanting to send the opposite of a smile, when being told to smile, either a slight electric shock or annoying sound, producing negative feedback with the hopes of changing the offensive behavior. The hope was that this tool would also work to educate people about the cultural assumptions and ideas of smile normalcy in western culture. Additionally, the Smile Transducer addresses current challenges with unwanted facial data collection from existing computer systems. This gives the users control of their microexpressions while obfuscating external data collection devices. In this intelligent, interconnected wearable world, we are moving beyond the physical experience of being told to smile, to having our microexpressions and other emotion/sentiment data recorded without our consent. The Smile Transducer moves beyond the transmission of smiles into the physical protection of our bodies. The upcoming version is modular and allows for users to design along the base, and to color and personalize their wearable, as a data protection accessory.